Short version. 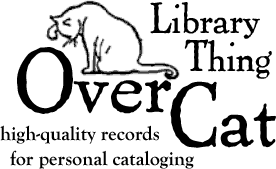 Our “Overcat” search now includes 12.3 million records from Harvard University! This release (“big data for books,” as David Weinberger calls it) is, to put it mildly, a Very Big Deal. Harvard’s collections are both deep and broad, covering a wide variety of languages, fields, and formats. The addition of these 12 million records to OverCat has significantly improved our capacity for the cataloging of scholarly and rare books, and greatly enhanced our coverage generally. Kudos to Harvard for making this metadata available, and we hope that other libraries will follow suit. For more on the metadata release, see Quentin Hardy’s New York Times blog post, the Dataset description, or the Open Metadata FAQ. And happy cataloging! Harvard requests and we’re happy to add: The “Harvard University Open Metadata” records in OverCat contain information from the Harvard Library Bibliographic Dataset, which is provided by the Harvard Library under its Bibliographic Dataset Use Terms and includes data made available by, among others, OCLC Online Computer Library Center, Inc. and the Library of Congress. This is absolutely terrific! Many thanks!